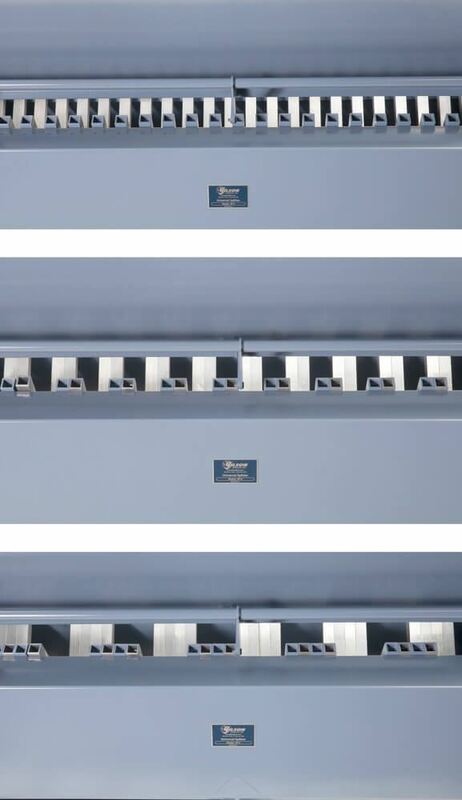 Universal Sample Splitters - Gilson Co. The Gilson Universal Splitters are the most versatile sample dividers available, assuring top accuracy and truly representative specimens when reducing bulk samples. Each Splitter features our exclusive, adjustable chute system and proprietary lever-release hopper. 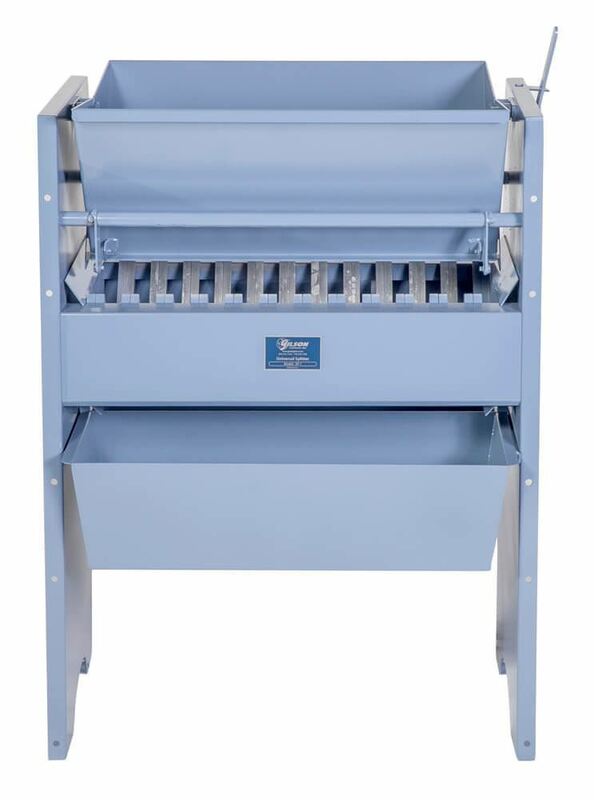 All Universal Splitters have a row of precision-machined aluminum bars to direct equal amounts of material to each side into sample collection pans. The operator arranges the chute bars equally on alternate sides, creating V-shaped chutes to the optimum width of 3 times the largest particle size. Once set, the bars are drawn together by tightening wing nuts on threaded ends of the rod. These adjustable chute sizes mean that one splitter can be optimized to do the work of several! Our gated hoppers hold the entire sample in place to allow proper material placement and even distribution prior to splitting. A simple pull of the lever releases the material to flow freely across the entire width of the chute openings, not just a portion. These features result in precise sample reduction. 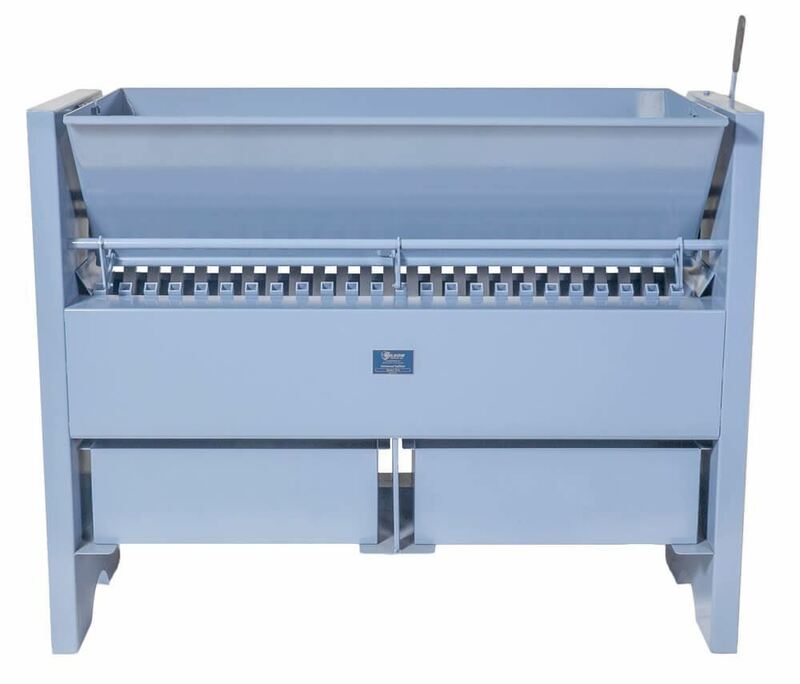 Standard 60° chute slopes on all models except the SP-1 and SP-2 improve material flow of lighter and finer materials while meeting certain coal or coke testing specifications. SP-1 and SP-2 models have 45° chute angles better suited to mineral aggregates. 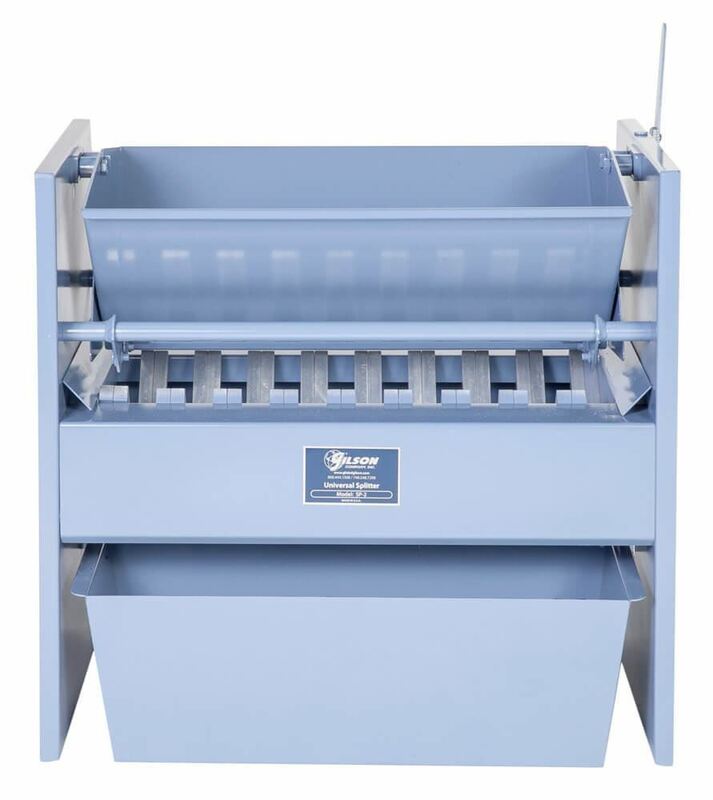 SP-0 Universal Splitters are built for large-volume bulk aggregate or raw coal samples. 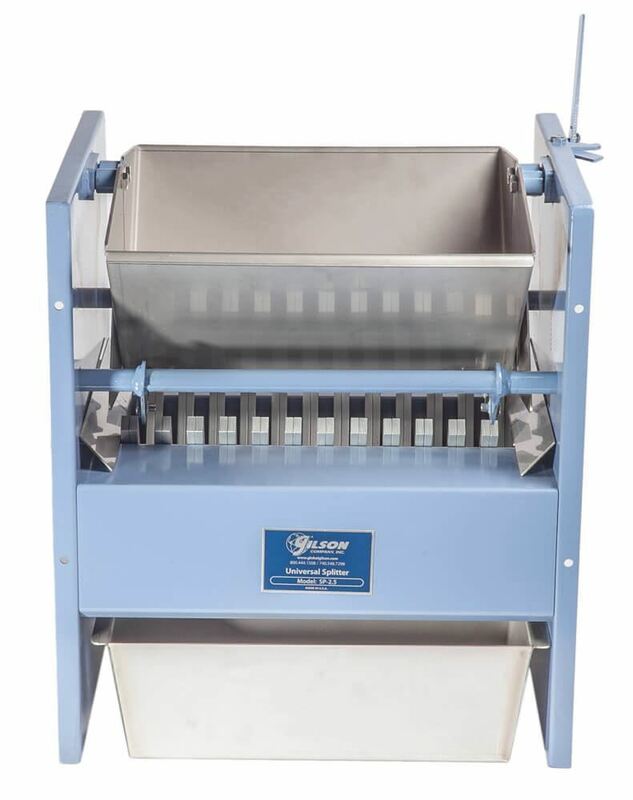 Other large samples with particle sizes up to 4in (102mm) can be accurately reduced with this rugged divider. Each split is evenly distributed to two pans on each side. Order additional pans as SPA-400 with 31qt. (29L) capacity. SP-1 Universal Splitters are rugged, large capacity floor models for laboratory or field use of materials with particle sizes up to 2in (51mm). The convenient size and a wide range of available accessories make the SP-1 our most versatile splitter. Chutes are sloped at 45°. Order additional pans as SPA-100 with 24qt. (22.7L) capacity. SP-2 Universal Splitters provide accurate representative samples for a wide range of materials and are more compact and durable than conventional portable splitters. These lightweight models have ample hopper capacity for materials up to 1.5in (38mm) and are convenient for floor or bench-top positions. Chutes are sloped at 45°. Order additional pans as SPA-101 with 14qt. (13L). capacity. SP-2.5 Universal Splitters are widely used for fine mineral aggregates up to 1in (25.4mm) and are rugged enough for field or laboratory use. The frame is painted steel, and most contact parts are stainless steel except for the anodized aluminum chute bars. Order additional pans as SPA-108 with 5.3qt. (5L) capacity.